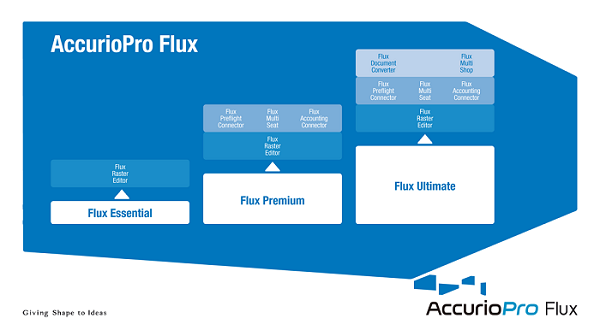 Version 7 of our printmanagement solution comes with a completely new name: AccurioPro Flux. There are also changes to the product structure and many new features that will simplify the printing process. We had already announced it and presented it at drupa: Konica Minolta JT Suite becomes AccurioPro Flux. The new brand AccurioPro bundles all digital workflow solutions from Konica Minolta. The name Accurio reflects the ultra-modern and high-precision (= accurate) technology of Konica Minolta, while Pro stands for professional use – et voilà: AccurioPro. Flux stands for the automated workflow, the fluid productive work, and now replaces our previous name "JT Suite". Our software solution is optimized for output on production machines from Konica Minolta. In addition, you can also connect printing devices from other manufacturers. You can add original Postscript Printer Description (PPD) files of 3rd party manufacturers. All features and options included in the PPD file are supported. This allows you to centrally control all machines in your print room. Optimize the utilization of your production machines by organizing them in printer clusters. Print jobs are distributed evenly across all machines in one cluster, even taking the device's individual printing speed into account. Create ticketless virtual printers to convert and impose native print files in one step. These virtual printers are based on hot folders and can be published as windows printers. Import native data streams directly in our application by using a hot folder. The data streams are stored permanently and can also be printed several times if necessary. The upgrade is available at your local Konica Minolta partner. If you have a valid Software Maintenance Plan (SMP), the upgrade to version 7 is free of charge.